Voters in southeastern San Diego said on Tuesday they were keen to push back against national and local policies and politicians they don’t support. 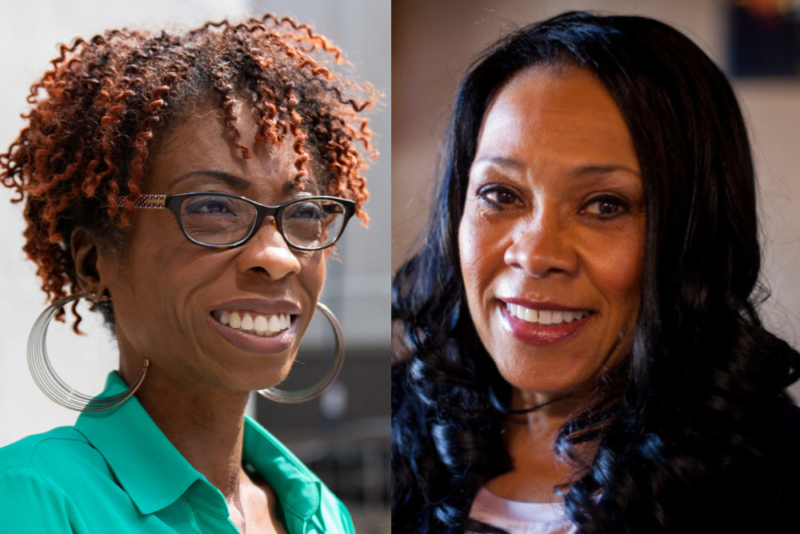 Many were particularly passionate about the tight race between City Council President Myrtle Cole and former Cole staffer Monica Montgomery, who narrowly defeated her former boss in the June primary. Steve Porter of Emerald Hills was one of a handful of voters who told VOSD he was concerned about Cole’s commitment to the district. He said Cole rarely attends community meetings and often doesn’t even send a representative to attend while Montgomery is a fixture at those events. Porter also hoped other voters might give former District Attorney Bonnie Dumanis a chance in the District 4 county supervisors race. Sharon Guillory, 63, who lives in the Valencia Park area, said she wanted to see new leadership in both City Council District 4 and District 4 of the County Board of Supervisors. Guillory said she voted for Democrat Nathan Fletcher for county supervisor and Montgomery for City Council with the hope that they’ll both bring fresh perspectives to their roles – and more attention to issues that matter to southeastern San Diego residents, namely economic development. Like Porter, Guillory said she hasn’t seen Cole in the district, while she’s seen Montgomery try to reach out and draw in District 4 voters. Others remain sold on Cole and argued she’s had more of an impact than many in the district realize. I met Stacy Anselmo, 25, after she dropped off her ballot at the upgraded Skyline Hills Branch Library, a project Cole rallied behind. Anselmo said some District 4 voters have unrealistic expectations about the pace of change in the district and don’t appreciate the more incremental progress Cole has helped make. “I do like what Myrtle Cole has been doing for the city,” said Anselmo. Retired teacher Willie Lassiter, 80, said he also remained committed to Cole. Cole’s experience on the City Council and at City Hall serves District 4 residents well, Lassiter said. Lassiter lives just outside the county district, so he was unable to vote in the race for supervisor. He and others in the district seemed more enthusiastic about the competing visions for the future of the Mission Valley stadium site. Lassiter was one of a few voters who said they supported Measure G, the SDSU West plan that would force the city to sell much of the former stadium property to the university so it can be used for student housing, a river park, retail and more. Others were excited about the possibilities associated with Measure E, the SoccerCity plan to force the city to lease the land to investors who pledge to create an urban district centered on a Major League Soccer expansion team. Encanto resident Ruben Estrada, 63, said he’d love to see a soccer team in San Diego. Ron Loper, 60, agreed and said he thought FS Investors, the group behind SoccerCity, presented the best plan to make it happen. But Sean Bohac of Rolando Park said he chose to say no to both options. Though SDSU West supporters have said their initiative would allow for more environmental reviews, Bohac said he wasn’t convinced. He also chose not to vote in the county supervisors race out of concern that Fletcher, a former Republican who joined the Democratic Party in 2013, isn’t truly committed to progressive values. “I am not impressed with Nathan Fletcher,” Bohac said. He was more impressed with Montgomery.